Ulta Micronized. Max Bioavailability. Athletic Performance. Enhance Muscle Volume. Superior Absorption. Ultra Pure No Filler. Creatine boosts muscle size, strength, and endurance. Creatine is one of the most researched and important sports supplement today. It’s a must for athletes wanting to increase workout intensity and delay fatigue. Research has shown supplementing with creatine can boost muscle size, strength and endurance, improve athletic performance, and speed muscle recovery. Saturating muscles with creatine improves your ability to quickly replenish and recycle ATP, which increases muscle energy and delays fatigue. Creatine Improves Exercise Recovery Time. Lactic acid is a by-product of anaerobic (without oxygen) exercise such as weight training. Lactic acid is responsible for the ‘burning’ sensation from muscle fatigue. When you can’t train anymore, it’s due to having run out of energy or a buildup of lactic acid. Creatine acts as a buffer against lactic acid, which helps to delay the onset of fatigue. 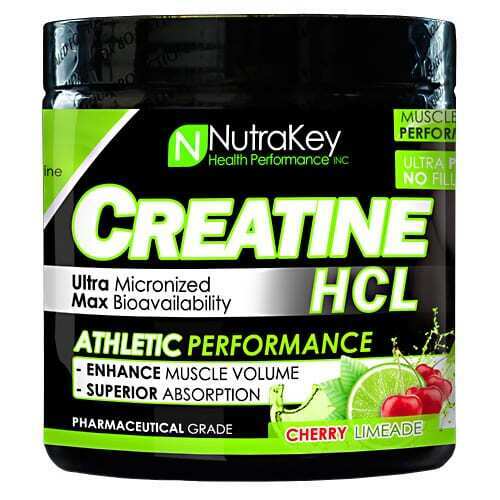 Why Creatine HCL? Superior absorption over creatine monohydrate. Lower dosage needed to deliver maximum benefits. No bloating or water retention.